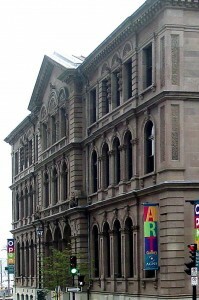 The Art Gallery of Nova Scotia in Halifax has one of the province’s best collections of paintings, sculptures and other artwork. The colourful scenes created by Maud Lewis are the highlight of the museum for most visitors. She suffered deformities because of a childhood illness and lived in poverty but still managed to depict joyful images of life in rural Nova Scotia. Her tiny one-room house, entirely decorated by Maud, has been reconstructed in the museum. Works by Tom Forrestal and inuit art are also worth a look. Volunteer guides lead gallery tours every day at 2:30 and, on Thursdays, at 7pm as well. When you’re finished looking around, go to the Cheapside Cafe in the art gallery. It has a fine selection of sandwiches, drinks and deserts. Directions: Just uphill from the ferry terminal and the Maritime Museum of the Atlantic. 1723 Hollis Street. Admission fees: Adults $10, children $3. Thursday nights by donation. Opening hours: 10am to 5pm, daily. Until 9pm on Thursday evenings. Closed Mondays between November and May.